When I see a nifty gadget that I want, I assume you want it too (especially when it's on sale). 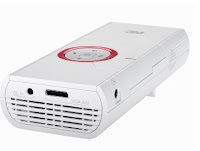 Check out this 3M Mobile Projector on Amazon. Today only they are offering it for just $125 and tossing in a FREE spare battery and FREE shipping with your order. This usually runs $300, and that's without the bonuses! This is a mini-projector for your iPhone, iPod, iPad, iPad 2, laptop and gaming device that projects a screen size of up to 80 inches diagonally. You'll get a two-hour charge per battery (or just run it on AC). It's great for watching a movie or playing with your apps. My family cabin doesn't have a TV, so my and the kids can watch a show against the wall at night.